Certainly this week’s release of the Council on Foreign Relations’ report calling for America to embrace systemic school reform is important. Not only does the piece makes clear the economic and national security stakes facing the nation as a result of the education crisis (matters about which Dropout Nation and your editor have long opined on), it actually goes further in offering particularly sobering data on the effects of America’s woeful traditional public schools on national security and diplomacy. Just four-fifths of U.S. Department of State foreign service officers stationed in Iraq met the agency’s rigorous foreign language proficiency standards, while just 27 percent of foreign service officers in Afghanistan did so. Little wonder why, contrary to the dissenting declaration of Harvard University foreign policy scholar Stephen Walt, our nation’s stature as the only world’s only true economic and political superpower is more perception than reality. But don’t think that Weingarten (or for that matter Darling-Hammond, whose general thoughtfulness on teacher quality reform is limited by her unwillingness to challenge her traditionalist colleagues) signed on to any of that. Declaring in her dissent that choice options “have not proven themselves to be sustainable or systemic ways to improve our schools”, Weingarten tosses out the zero-sum-game argument, proclaiming that vouchers, charters, and other options will do little more than “deplete badly needed resources from our public schools” as well as (she insinuates) divide society and the common good. From where she sits, any championing of school choice and Parent Power (along with efforts to overhaul the traditional systems of teacher compensation and performance management that have long-sustained the influence and coffers of the AFT and National Education Association) will lead to the end of public education and American democracy. Wrote Weingarten: “A move away from that public system could do greater harm to our national security and common bonds than nothing at all. 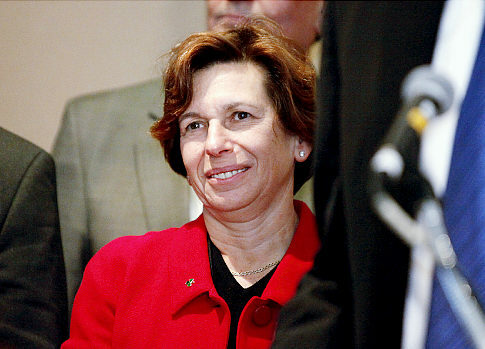 Certainly Weingarten neglects to mention that charter schools are just as much public schools as traditional district counterparts; the fact that they are managed by non-profit and for-profit operators (including AFT affiliates in Boston and New York City) means little since they are often subjected to similar levels of oversight (and, unlike traditional district schools) can be shut down for academic and fiscal failure. But that’s to be expected. Just because the AFT likes to play up the fact that its legendary leader Albert Shanker helped launch the charter school movement doesn’t mean they actually want charters to exist in any meaningful way. The bigger problem with Weingarten’s argument is logically false argument that somehow school choice can’t be allowed in American public education at all. From Weingarten’s perspective, public education should remain a system of district bureaucracies that control where students go and the quality of education they receive (with AFT and NEA locals influencing how districts operate through collective bargaining agreements, the spending of their campaign largesse, and lobbying in statehouses). But in plenty of industrialized nations, public education is more about funding a wide array of educational opportunities from which families can choose than about maintaining failing and mediocre bureaucracies. In Canadian provinces such as Ontario, Catholic schools are fully funded out of state coffers, while Alberta has embraced the charter school concept. In Ireland, the government funds Catholic schools as well as multi-denominational private schools. Belgium and the Netherlands has long ago moved to a system of public financing of educational options; in the former, “free schools” operated by groups affiliated with the Catholic Church serve larger number of students than government-run schools. Australia also partially funds private schools, with families of children attending them paying the remainder of the costs out of their own pockets. Meanwhile Weingarten’s argument that somehow school choice harms “democracy” and frays “common bonds” falls flat on its face. Forget her ignorance of the reality that the United States is a pluralistic society in which, save for common agreement over liberty, freedom, and a Democratic republican form of government, there is plenty of diversity of — and disagreement over — everything from culture to religiosity. A system of publicly funding educational options through school choice would do little to harm democracy because federal, state, and local governments — all elected by citizens who also benefit from choice — would still be in charge of how those dollars are spent. While the schools may offer their own approaches to providing students with high-quality education, state and federal governments would still be able to hold those schools accountable for results. This can already be seen in Milwaukee, home to the nation’s oldest school voucher program. Since the launch of the Milwaukee voucher program 21 years ago, Wisconsin officials adopted rules that required private schools accepting voucher students to meet state curriculum standards, and use the state’s assessments to monitor student (and school) performance. This had results. As noted in the University of Arkansas’ latest study on the Milwaukee voucher effort, students using vouchers saw even greater gains in student achievement than earlier generations of students funded by it; it may have also improved the overall quality of educational options throughout the city. Meanwhile Weingarten’s argument that choice will somehow fray common bonds is also off-target. If anything, by expanding choice, states can actually create systems of educational financing that can foster truly public schools that serve the public and deal with the diversity within American society. One of the dirty secrets of American public education is that it was almost never really created to educate students, but to inculcate students in a Unitarian Protestant-tinged civic religion embracing one form of American citizenship wihile squelching competing religious views (including those of Irish Catholic emigres, other immigrant groups, and Calvinists and Baptists). It is the reason why states began passing Blaine Amendments banning states from funding parochial schools — and why the Roman Catholic Church, rebelling against this religious bigotry launched what remains the alternative schools of choice for so many in much of the country. Even today, traditional district schools aren’t really built to educate students. But one can also argue that they also does little to foster true acceptance of diversity or bolster citizenship and common ties. Traditional district schools remain bastions of forced segregation (racial and socioeconomic) thanks to zoned school rules and other Zip Code Education policies that restrict choice; battles over school prayer and other issues have also made traditional schools less able to promote either diversity or citizenship. Meanwhile the schools that turn out to be the most-socially and economically diverse — and the ones most-likely to foster active and passive citizenship — are parochial and charter schools. As Boston College researcher Jack Buckley and State University of New York at Stony Brook professor Mark Schneider pointed out in a 2004 study, research has shown that Catholic schools are particularly successful at fostering citizenship, while charter school students are more-active in community activism (and are as tolerant of others) as traditional district counterparts. Patrick Wolf of the University of Arkansas reached similar conclusions in his meta-analysis of 21 studies several years later. Charter schools may also turn out to be good at fostering strong racial and ethnic pride, especially among black children. Why? Because families may often send their kids to mostly-black charters (or what charter school foes often wrongly call segregation) to as much instill healthy pride in themselves and their race (through opportunities to interact with successful peers and role models) as they aim to give their kids a high-quality education. American Indian, Alaska Native, and Native Hawaiian families, whose communities have long been assaulted by the federal government’s “kill the Indian, save the man” assimilation policies, can (and thanks to the charter school movement, have begun to) use choice as a way to preserve their languages and cultures. Given the lack of abundance of successful black, Latino, and even Native American men, instilling pride and preserving cultural traditions becomes nearly as much important for these families as the quality of teaching and curricula. This ability of choice to truly build diversity and common bonds isn’t surprising. Religious feuding in the Netherlands and Belgium ceased by World War I after governments in both countries decided to finance parochial school options. Based on the experiences in those countries, there is plenty of evidence to suggest that choice fosters both diversity and strong common bonds. This, in turn, will help advance our efforts to improve national security. Young men and women who learn more about others and become good citizens will also serve as strong players in understanding the nuances of diplomacy and other cultures, as well as be powerful ambassadors of American ideals. This isn’t surprising After all, Weingarten can be as intellectually disingenuous as fellow traveler Diane Ravitch. The difference is her disingenuousness is more-difficult to mock and dissect. After all, she is the head of the nation’s second-largest teachers’ union. More importantly, until a series of blow-ups (including Dropout Nation‘s revelation of an anti-Parent Trigger law strategy presentation by the union’s Connecticut affiliate), she was besting National Education Association counterpart Dennis Van Roekel as the most-politically savvy player for the education traditionalist side. Weingarten even managed to use her triangulation efforts to convince all but the most-skeptical reformers of her good intentions. She parrots class warfare rhetoric — including attempting to co-opt the Occupy Wall Street movement — even as she earns the kind of paychecks normally reserved for corporate chieftains (and does what she can to avoid paying higher taxes, just like anyone who has rightfully earned their checks, including those she criticizes). But when it comes to school choice, the lawyer-turned-teachers’ union leader (who managed to spend minuscule amounts of time teaching at New York City’s Clara Barton High School) isn’t nearly all that deft. She would be better off embracing the power of choice.